As a civil engineer I use laser distance meters (LDM) often and share different models with my colleagues. Therefore you can profit from my experience and my theoretical background. Maybe the following points can help to find out which features of LDMs are musts before you buy a new tool. Of course these points are from my point of view. 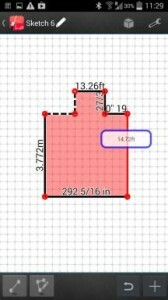 If all your measurements will be inside the first point is less or even not important at all for you. If I have to measure outdoors and the distances are bigger than 20 feet I always choose the laser distance meter that offers a digital point finder. If it is necessary to measure in bright sun light you should take a LDM with an optical scope or much better a digital point finder. As lots of my measurements are horizontal and low above ground the digital point finder is more comfortable. Using an optical scope would require laying on roads or even highways. I can’t use a laser distance meter without any optical instrumentality for those measurements. My Leica Disto uses a 4x zoom digital point finder which reminds me of the zoom function on a digital camera or smartphone. The LCD display shows cross hairs which are precisely calibrated with the laser. Even if the targeted area is small you can be sure to measure to this point when you put it in the crosshairs even if the laser point is not visible. Why is this ISO (International Standards Organization) rating important for LDMs? The standard defines conditions and test cases that a laser distance measurer must go through. Only if the measured distances keep in a small bandwidth of accuracy the LDM gets the ISO 16131-1 rating. 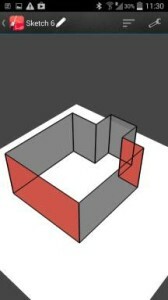 The conditions of these tests are important because they are similar to real conditions on for example building sites. It is not a test under best-case conditions. Look for an ISO 16331-1 certified laser distance meter. These cost just a little more, but this is way less than the consequences from measuring wrong using a low budget tool. If the laser distance meter has a Bluetooth interface, you can create sketches in apps or work in CAD-programs as for example Autocad. The apps work with smartphones (iOS or Android) or tablets which can be used to create detailed plans on site. If your gadget has a built-in camera you can overlay measurements on photos you take. The Bluetooth interface brings the LDM’s measurements directly and immediately to these apps. Documentations and plans can be stored or sent to the office just after finishing work. Professionals like architects or interior designers save half the time in building an accurate floor plan. The Bluetooth technology slightly increases the price of a LDM. But more efficient working methods pay you back very soon. Meanwhile models with Bluetooth are available even in middle class and low-end. There are some cheap laser distance meters which use old technology. If the LDM sounds “click-click” during them measuring process, the tool uses an older technology that can be compared to the mechanical shutter on a camera. If you use the LDM often or drop it the moving parts can be damaged or even broken. So look for the latest technology in form of a real high-tech tool. IP stands for “Ingress Protection”. This means resistance to moisture and dust. 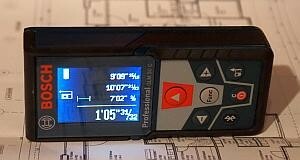 A lot of cheap laser distance meters are IP40 tools. They aren’t tough enough for the daily use on building sites as the focus on the DIY-market. As a professional you shouldn’t go below IP54 which means that the LDM is dust resistant and moisture resistant. They can get dusty or damp without refusing work or getting broken. But keep in mind to dry them off before putting them in a case. For really tough work and bad conditions look for an IP65 tool. This is dust proof and water jet protected. Maybe this LDM will still work if conditions get too bad for yourself. Endpiece for narrow corners automatically switched on/off. Button sound that could be switched on/off.